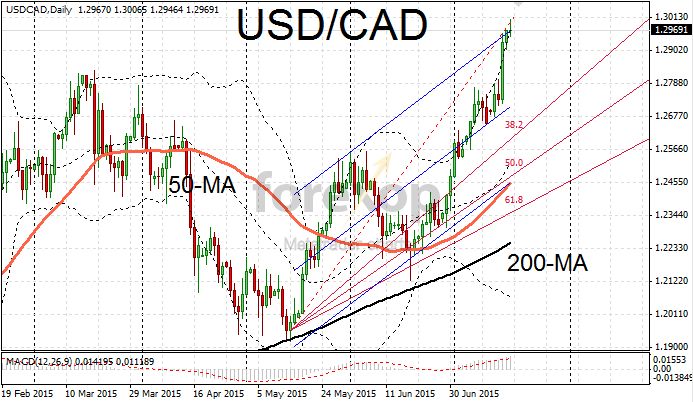 CAD remains in a weak position following the Bank of Canada’s second surprise interest rate cut last week. 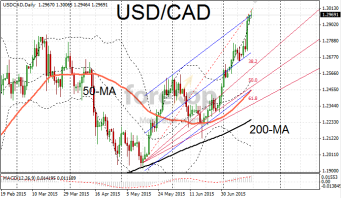 USD/CAD is testing the 1.30 line with renewed vigour. The pair broke through 1.30 briefly last week for the first time in six years. On the four hour and daily timeframes USD/CAD has extended into overbought territory – which usually indicates some consolidation and pullback is impending. Support is expected around 1.2950 and beneath at 1.2724. CAD/JPY which typically shows close correlation with oil prices has fallen back for six consecutive weeks. At 95.6 CAD/JPY is now below the 50-week moving average and is taking support around 94.9. Core inflation at 2.3% p.a. to June came in ahead of forecasts but this wasn’t enough to revive the “Canadian loonie”. The Bank of Canada’s decision to reduce the target overnight rate to 0.5% and revise down growth forecasts took the markets by surprise. The country has struggled amidst falling demand for crude oil – one of its core exports. The bank lowered rates at the start of the year in a preventive move but it wasn’t enough to compensate for the ongoing weakness in the commodities sector. Also suffering the fallout, the Australian dollar fell back to lower support at 0.7369 against the US dollar. The bear rally which has pushed AUD/USD down 10% since the start of the year remains unbroken. AUD/JPY established support at the 200-week moving average. After descending briefly below the 90 level last week, AUD/JPY recovered back to 91.4 to remain within the long-term upwards channel. The “Aussie” is suffering similar headwinds as the Canadian dollar. The slowdown in demand from China has hit the country’s exports in commodities including metals and energy. Important events this week include the release of the minutes of the Australian central bank’s last meeting. This release is scheduled for Tuesday evening. This will be followed by a batch of official inflation figures on Wednesday. Will OPEC’s Agreement Support Oil Prices?